The Department of Science and Technology (DST) is the South African government department established to ensure that there is greater coordination, integration as well as better management of all government funded science and technology institutions and to provide a holistic overview of public expenditure on science and technology. The CSIR is a scientific and technology research, development and implementation organisations in Africa. Constituted by an Act of Parliament in 1945 as a science council, the CSIR in South Africa performs multidisciplinary research and technological innovation with the aim of contributing to industrial development and improving the quality of life of people in South Africa — and increasingly on the wider continent. The CSIR’s main site is in Pretoria, while it is represented in other provinces of South Africa through regional offices. The CSIR is committed to supporting innovation in South Africa to improve national competitiveness in the global economy. Science and technology services and solutions are provided in support of various stakeholders, and opportunities are identified where new technologies can be further developed and utilised in the private and public sectors for commercial and social benefit. The CSIR Meraka Institute is an operating unit of the CSIR focused on Information and Communications Technology (ICT) research, innovation and advanced Human Capital Development (HCD). The South African National Research Network (SANReN) is a high-speed network dedicated to science, research, education and innovation traffic and has been rolled-out in a phased manner since 2007. The SANReN CA is responsible for the design, acquisition and roll-out of national and international capacity for the SA NREN, as well as the development and incubation of advanced services. It forms part of a comprehensive South African government approach to cyberinfrastructure, geared at ensuring the successful participation of South African researchers in the global knowledge production endeavour. 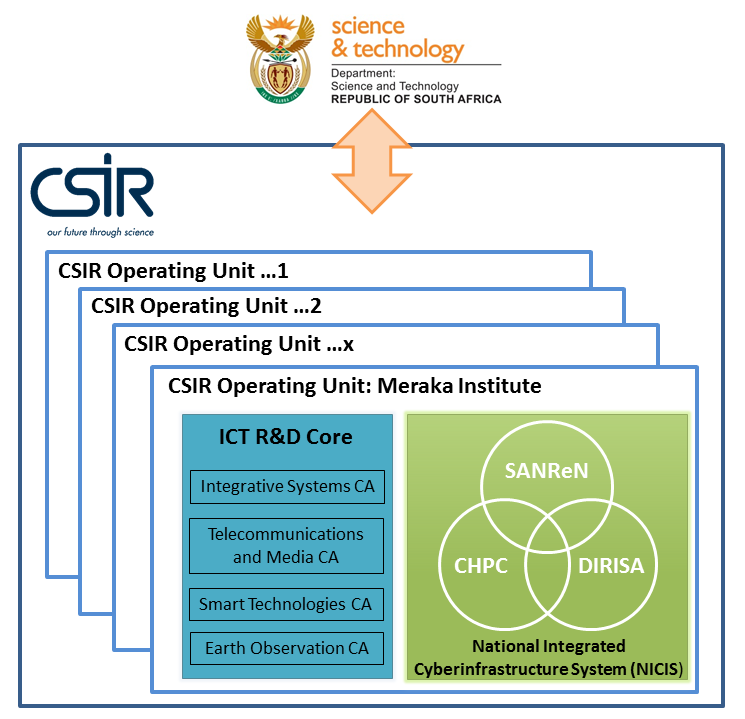 SANReN is managed and implemented by the CSIR’s Meraka Institute and is a key component of the National Integrated Cyberinfrastructure System (NICIS), alongside the Centre for High Performance Computing (CHPC) and the Data Intensive Research Initiative of South Africa (DIRISA).